"Class of 1958 Gift -- Hi-Fi for Jacobs Hall"
From The Archway, Page 1, July 11, 1958: "The Senior Class gift will be an eight speaker high fidelity set that will be installed in Jacobs Hall in the near future, Senior class officers announced yesterday." Jacobs Hall on Bryant's former Providence campus was dedicated on June 7, 1958. This building included a library, dining halls for faculty and students, and classrooms -- including a typewriting classroom. 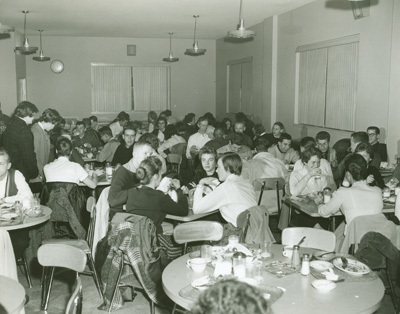 It is assumed that the Hi-Fi system was for the student dining hall.